There are two Angiographylabs in the Yangon General Hospital. This is where Cardiac Catheter nurse, Kate Littlejohns, and Cardiologist, Dr Jason Sharp, spend their days. Here they do electrophysiology studies, pacemaker insertions, angio stents, and atrial septal defect repairs. When I visited them, Jason was busy supervising removing a blockage of a right coronary artery in the heart, by angioplasty. Angioplasty involves passing a collapsed balloon over a wire into an artery and inflating it to a fixed size, in order to open up the blood vessel for improved flow. The sophisticated positioning of the balloon is guided by fluroscopy. The patient may have some light sedation during the procedure. 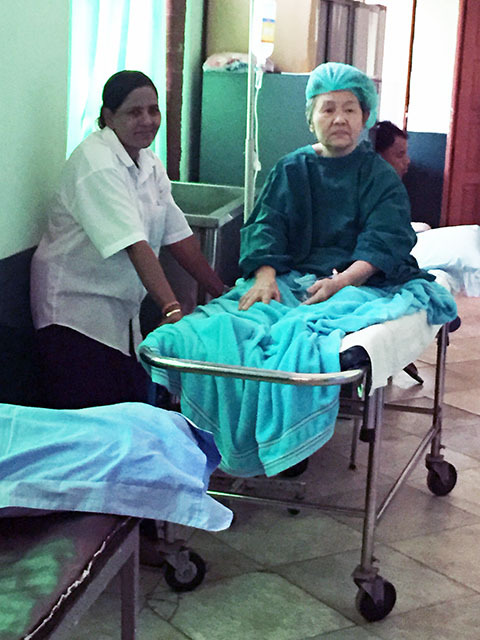 (L) picture:A patient with daughter waiting outside of Angio Suite. 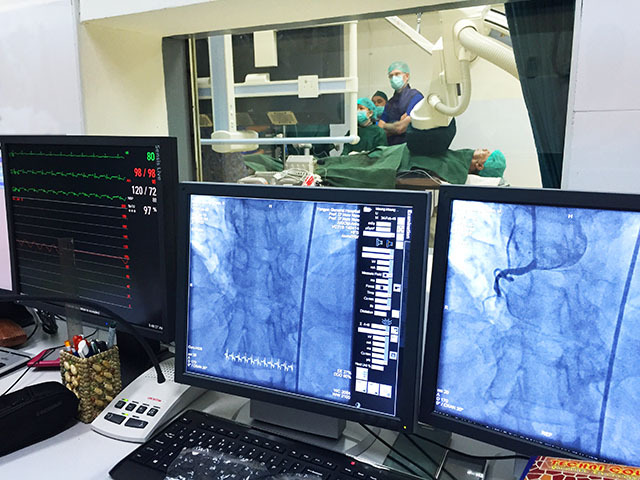 (R) picture:A blocked main coronary artery shown on screen, while Dr. Jason Sharp seen through glass window supervising an angioplasty. Kate tells me the local Burmese Angiography Radiographers and Nurses she works alongside, are fairly proficient in their job and don’t require significant assistance from Open Heart International. Kate’s main role is to support if there are any serious complications during one of these more tricky procedures. She is often the person on the outside, not aseptically gowned up, or wearing lead aprons. She is there to retreive the balloons, stents, or emergency medications as needed, in the quickest and most efficient manner. In the learning phase trying to ask a local nurse to get urgently needed equipment can cost valuable time as it can sometimes be a bit of a slower process due to language barriers. Both Kate and Jason have been working as a close knit team for years now both in Myanmar and back home in Australia. Their work, as well as our other volunteers is commendable and does not go unnoticed. 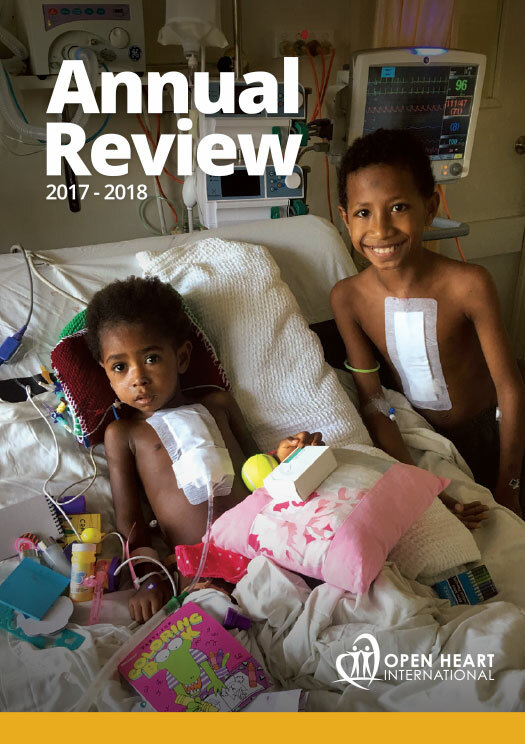 Their work continues to extend the capacity of the Burmese team, and means they are able to help more patients independently of Australian team visits. 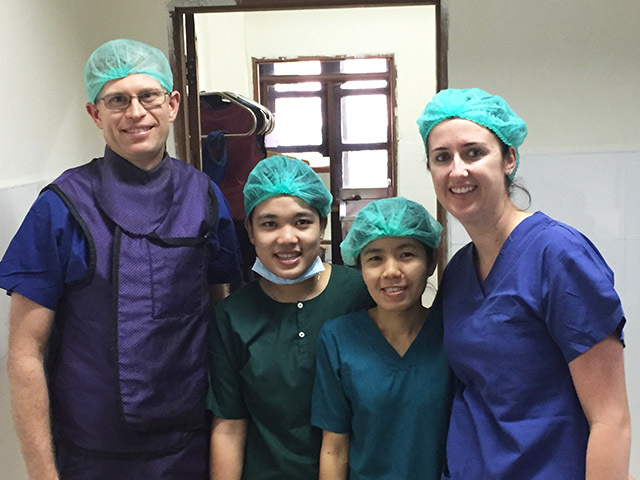 Picture: Jason and Kate with Burmese Angiography Nurses.